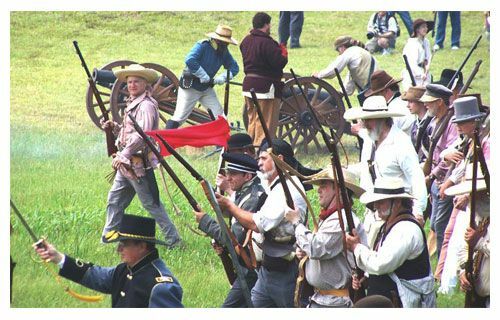 Texian troops storm the Mexican lines during a reenactment of the Battle of San Jacinto. The Battle of San Jacinto, fought on April 21, 1836, near Lynchburg, was the decisive battle of the Texas Revolution. Led by General Sam Houston, the Texas Army engaged and defeated General Antonio López de Santa Anna’s Mexican forces in a fight that lasted just eighteen minutes. Hundreds of Mexican soldiers were killed or captured, while only nine Texians died. BAYTOWN — The Bay Area Relay for Life, a time to celebrate those who fought the good fight against cancer and to remember those who have lost the battle had another opponent this past weekend: the weather. With dark clouds hovering, the Relays opening ceremony began shortly after 6 p.m. with a butterfly release and opening lap by survivors. Survivors, both young and old alike, each wearing a medal around their necks, walked the track to cheers, claps and yells of support. Within hours, however, thunderstorms came through literally raining on the parade of the thousands of walkers on the track. More than 150 teams participated this year. As team members walked the track they cold not miss colored bags lining the track, each with a candle inside and bearing the name in honor of a cancer survivor or in memory of a person lost to cancer. More than 4,000 of the luminary were sold this year, topping the $70,000 goal the relay committee had set. At 9 p.m. the candles were supposed to be lit. Mother Nature had other plans. Organizers decided that the weather was too bad to continue and shut down the event, rather than wait until 8 a.m. the following morning as planned. Event organizers say that this is the first time in the Bay Area Relay For Lifes 12-year history than the luminary ceremony had to be canceled. The shortened event also hurt teams who planned to continue their fundraising throughout the event, whether it be Cedar Bayou United Methodist Churchs crawfish boil or Grace United Methodists raffle for a basket of tunes and two handmade crochet throws. 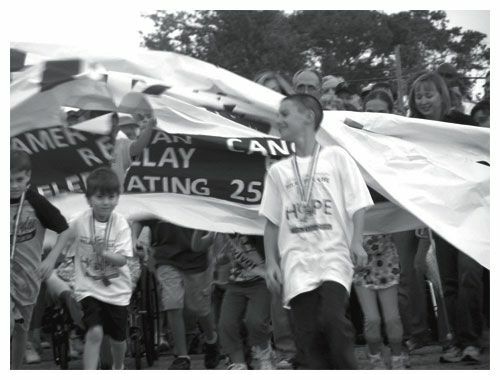 An estimated $570,000 was turned in on the day of the relay, about $200,000 short of the committees goal. However, more funds are expected to be turned in over the next week. Allison Selensky, of Grace UMC, said they continued to sell raffle tickets at the church on Sunday in order to raise more funds for the relay. The Bay Area Relay for Life has been the top fundraising relay in Texas for the past eight years. Organizers say they will just have to wait and see if it will be nine in a row or not. The rain also caused some trouble for volunteers leaving the event site. Those who arrived early to set up their camps on Friday parked in a grassy field. The rain, however, turned the field into a mud pit that forced many cars to become stuck and left over night. Flash floods last Saturday turned familiar roads into strange streams. Rapidly climbing water in Newport and Indian Shores caused the fire volunteers to erect barricades to warn of high water. Rain reached 6 inches in Crosby by the afternoon. Hare Road became so impassable the library closed early. Above a wrecker truck takes the higher inclines of South Diamondhead to rescue one motorists vehicle, while others scurried past undaunted. HIGHLANDS  Do you want good news, or bad? Dan Parsons, President of Houstons Better Business Bureau, brought both in his lively talk at the Rotary lunch last week. The good news is that the Houston Better Business Bureau is an advocate for the consumer, and for businesses. This means they walk a delicate balancing act between the two parties, helping facilitate disputes and business decisions. Last year, the BBBHouston received over 30,000 complaints, and resolved most of them. The BBB has over 9000 members, so this is not a disproportionate amount of problems. In addition, nationally the organization receives over 1,500,000 monthly inquiries for information about businesses, Parsons said. He said the bureau works on the goals of being relevant and helpful in todays business climate, which he noted has begun to improve. A new rating system for member companies is being studied, giving A to F grades to businesses based on an algorithm of facts, such as size, age, type of business, and complaints. The bad news is that the bureau gets many reports of fraud and irregular business practices, which they try to resolve. 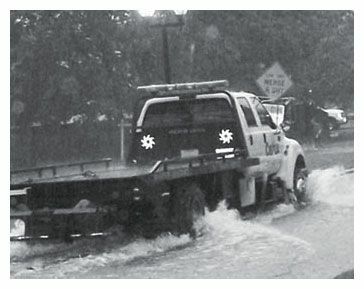 After Hurricane Ike, many storm chaser contractors showed up, cheating local residents. Another problem he warned about, is that many white collar financial criminals have now served their 10 year federal sentences, and should be back in the work force soon, probably scheming even more than before because of what they learned in prison. In closing, he warned that everyone falls for a fraud scheme at some point, so be cautious and skeptical, and call the BBB if you need help or information. 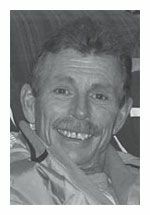 Timothy Jay Burger affectionately known as Jay to all his family and friends passed away on Monday April 20, after a 20 month battle with cancer, at the age of 51 in Crosby, Texas. He was a prominent businessman owning Jay Burger Signs & Service and Precision Lighting and Maintenance for 26 years. 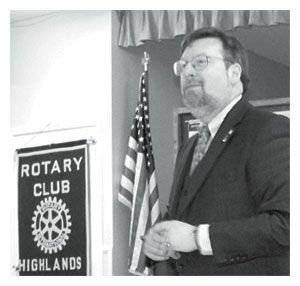 He had been very active within the community being past President of the Highlands Rotary Club, member of the Channelview Lions Club and member of the North Shore & Highlands Chamber of Commerce. His passion was being on the water and any kind of car, boat or motorcycle that would go fast. One of the last dreams he fulfilled before becoming ill, was to own a houseboat on the Tennessee River. He was born in Nashville, Tn., and grew up in Chattanooga, Tn., graduating from East Ridge High School; he has remained close friends with a lot of the kids that he went to kindergarten with. He is survived by his loving son Andy and his ex-wife Sharon, whom he lived with until his death. He is also survived by his special brother Chuck Burger and wife Pat and their son Chas of Cleveland, Tn. He is also survived by his mother, two brothers, and a sister whom he has been estranged from for over 20 years by no fault of his own. He is also survived by his special sister-in-law Pamela Hilton whom he loved dearly, and her husband Stan Frederick, along with his special little buddy, his nephew Jacob Frederick. He also leaves behind his 3 little dachshunds Woody, Nugget, and Daisy. Jay was very fortunate to have so many special friends Joe Boutte, Fred Zabac, and his family along with their children Fred Michael, Alexis, and Emily that made an endless supply of his favorite Cupcakes. Tom Edison was his favorite camping buddy. Dad  You are gone in body but you will always be with me in spirit… throughout the rest of my life… Thank you for teaching me to be the man that I have become. I will always love you. Former Superintendent Don Hendrix call upon the director of St. Martin De Porres Choir to sing a few songs from the golden days of Rhythm and Blues at last Fridays Celebration of A Life of Service John Victor. Victor was said by Hendrix to know more rhythm and blues than any man alive and knew the words to just about every song. 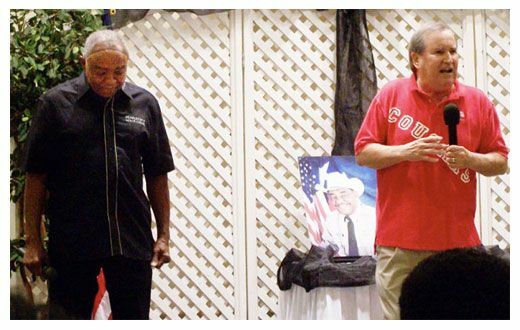 The event featured addresses by Reverand Ron Eagleton; a lighthearted salute from fellow deputy, now turned Constable Ken Jones, Michael Joseph directing ceremonies and a panoply of musical salutes featuring extraordinary gospel arrangements including a solo from Lounis Freeman.